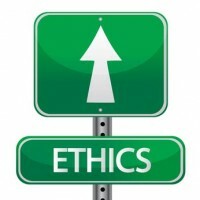 In my last blog post I talked about some of the impacts of having a lack of ethics in an organisation. Like any culture change process we need to understand roles and responsibilities. In particular, you need to understand who should ‘own’ the business ethics process and who should communicate the agreed processes to management and team members. The typical roles usually match how we will implement a project or new capability into the organisation. First of all we need to work out who will develop, implement and monitor business ethics behaviours. It is also a good part of design to set up the governance process around who approves the framework and monitors the implementation of this culture change program. Ideally this is the most senior leadership team in the business and may be a governance board. The implementation team needs as a starter to understand your own blind spots, which may permit, or even encourage, the unethical behaviour you are trying to extinguish. So it is a good idea to have an independent party review the business ethics framework prior to implementation so we are not overlooking any areas due to our own unconscious bias. Have a think about how your organisation promotes ethical practice. It is often not discussed in great detail and assumed that people follow the rules. But to build a culture of ethics we need to change the culture.